I needed a date and time range selector for my application, so I’ve made this one. Please do let me know what I can do to improve it. 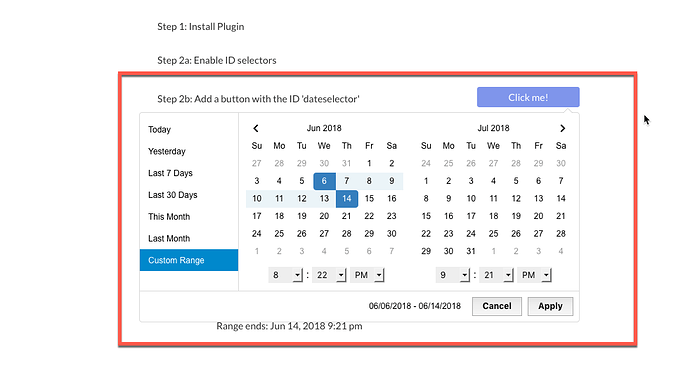 Date/time range Selector Plugin page on Bubble. 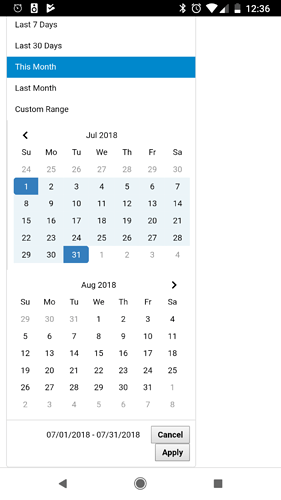 Add Date/time range Selector in one click to your app. 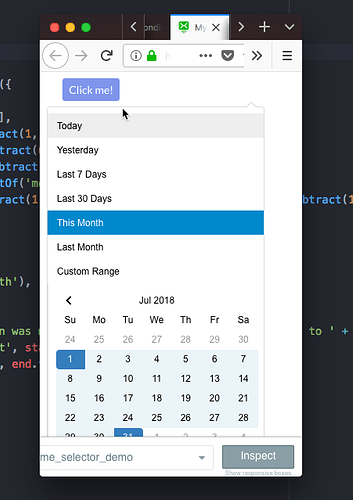 Bubble lets you build web apps without any code. More documentation coming ASAP, for now here is a screenshot and a silent walkthrough video. On page load, range defaults to current month. Is there a reason you default to todays date, rather than empty? Can you supply a default range to the plugin? How does it look on small mobile screens? Its good to have a video. It’d be nice to hear a voiceover, even if its " … and we wait with bated breath as the leopard inches its way forward, the yeti twitches its ears nervously, somehow sensing danger is approaching … "
I can give some critique on the plugin coding too, if you want. That’d be great @mishav, I’ll add a default range to the dev backlog, shouldn’t be difficult (famous last words). I default date start and date end to the first day and last day of the month respectively, because in general my users want to see a month’s worth of data. For sure there are other use cases so I’ll definitely add a default range option. Re: video - you’re right… I’ll do something proper in the next day or two, would like to have it done properly and in depth so I’ll wait 'til I’m fresh. I’ve tested a bit on a mobile version, and it works - although I haven’t specifically designed it for this purpose. It’ll work, not sure if it’d be optimal. For some reason every time I click on any of the options on the left such as last 7 days or this month, the element disappears…anybody else have the same issue? Would be a great feature to add Auto-binding to this plugin… as the value is changed, auto-bind it to parent. Thanks for the input guys! I’m swamped with projects at the moment so can’t support this properly. I think it’s open source - let me know if not and/or if you want the code and/or to be added. That would be great to have the code or for it to be added.